While the major indices may be slightly higher heading into the final hour of trading, technology stocks have lagged behind. More specifically, those in the Software and Services industry. As of this writing, there are only two stocks to have managed to stay in the green on the day: Redhat (RHT) and Total System Services (TSS). Granted, even these are fleeting as RHT has been floating between red and green, and TSS’s gains are nothing spectacular. Conversely, Fortinet (FTNT) has gotten hit particularly hard having now fallen nearly 5%. In all, of the 34 total S&P 500 stocks in the industry, 20 have declined 1% or more today. This comes on what has been nothing short of an impressive run so far in 2019. Only two stocks, RHT and Citrix (CTXS), have seen less than a 10% gain YTD. Interestingly, CTXS was flat YTD this morning, but today’s decline also brought it into the red on the year; the only one to have done so. Of the others, factoring in today’s declines, half of the index has now risen 20% or more on a YTD basis, and five of them have seen more than a 30% gain!. Cadence Design Systems (CDNS) being the leader of these now has risen 45.65% since the start of the year. 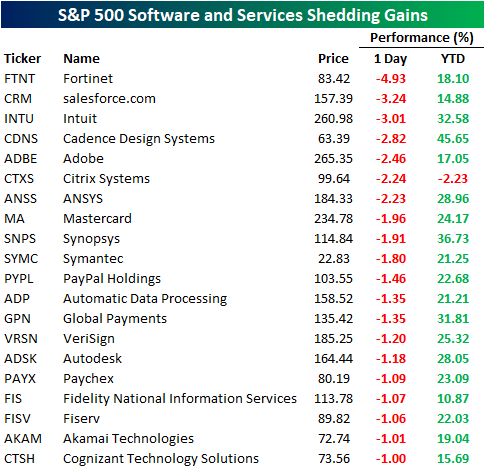 Below we show the performance today and YTD of the 20 biggest decliners in the Software and Service industry. 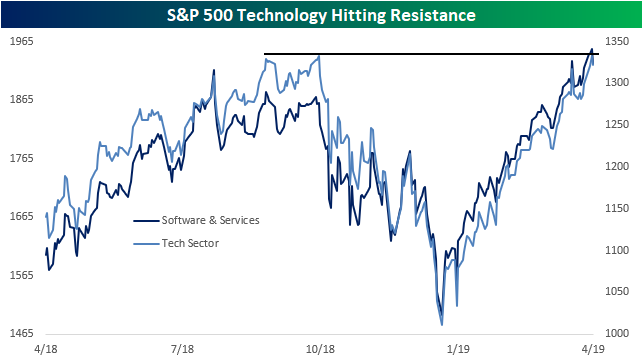 The price action of the broader Technology sector may be partially to blame for the Software and Services industry’s declines today on what has become an interesting technical set up. Below we show the chart of both the Technology Sector index and the Software and Services industry index. Recently, the Software and Services industry managed to break out above 2018 highs, establishing new highs in yesterday’s trading. On the other hand, the Technology sector only came up to its 2018 highs yesterday but sharply rejected those levels in early trading on Thursday.